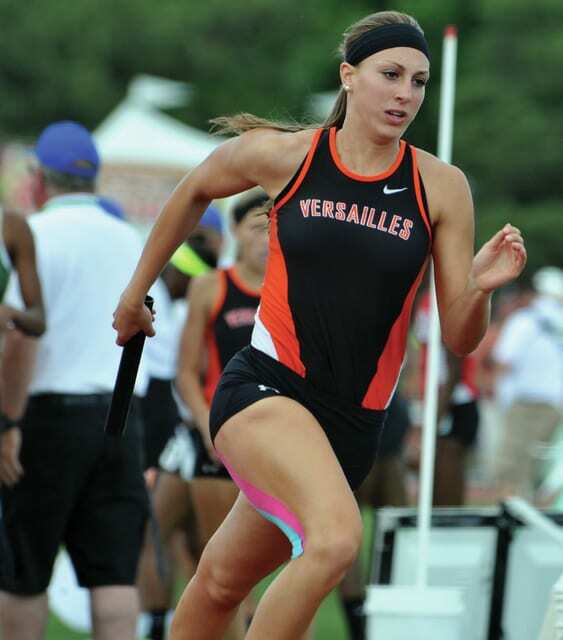 Mike Ullery | Daily Call Haley Winner runs one leg of the 1600 relay race for the Versailles Lady Tigers. COLUMBUS — As the Division II girls 1,600-meter relay race developed Saturday afternoon at the state track and field championships at Jesse Owens Stadium, it was very clear that something special was developing. And would you expect anything less from a Versailles girls relay team? The Lady Tigers put a punctuation mark on the amazing career of Taylor Winner and nearly shocked everyone, before finishing second in the race in a school-record time of 3:56.70 as the team of Haley Winner, Kayley Ruschau, Taylor Winner and Camille Watren took more than seven seconds of their prelim time of 4:03.80 from Friday. The Fighting Irish’s winning time was 3:55.63. Haley Winner had the Lady Tigers running neck-and-neck with the leaders after the opening leg. Ruschau, just a freshman, followed that with one of the strongest legs she has run all year and the Lady Tigers were in third-place at the halfway mark. Taylor Winner, running her final high school race, had the Lady Tigers in second place after three legs, fighting three girls off the last 100 yards. Watren immediately started closing the gap — bringing the crowd to their feet. She did everything she did to catch up as the crowd roared over the final 100 yards. Watren was still feeling the affects of her run 15 minutes after the race, carrying a “puke” bucket in front of her. Taylor Winner had a lot of amazing moments during her high school career. She was part of state championship teams in three different sports (volleyball, basketball, track and field) and ran on the 1,600 relay team that won a state title to clinch the team championship two years ago. And she would tell you Saturday was just another amazing moment she won’t forget. And Watren didn’t want to think about next year just yet.